View: Forest view and view of the "holler". Excited to spend time with two people who I love so much! 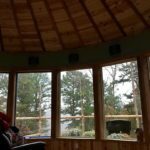 I love what Blake and Mel have been able to accomplish out here in Eureka Springs as they have built several Yurts. For those of you who don’t know, Blake and Mel opened their home to me for a few years while I was interning at GOC. They are family and I have missed them so much! Loved waking up to this beautiful view this morning. If you’re ever looking for a quick getaway consider Eureka Yurts and Cabins!